This week I thought I would start with Paula the Polar Bear’s visit to Canterbury Cathedral precincts on Wednesday. She only visited her adoring public for short periods due to the warm weather – Canterbury is hardly the Arctic even with global warming and deep ice sheets melting to the north of Greenland. 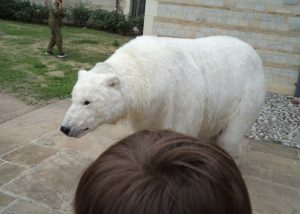 So why am I mentioning the visit of a ‘polar bear’? Well as regular readers of the blog will know Dr Diane Heath studied the medieval bestiary (‘book of beasts’) for her doctorate and she contributed to the Turner Contemporary exhibition at Margate on ‘Animals & Us’ (running until late September). Among the exhibits, the display showcases the medieval bestiary belonging to Canterbury Cathedral Archives & Library and Paula’s appearance was linked to this association between Margate and Canterbury. 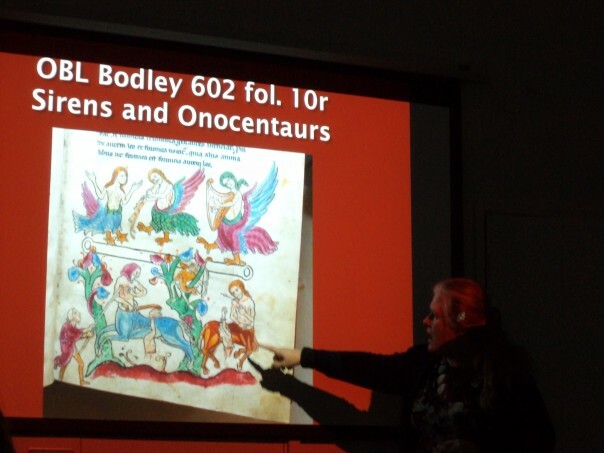 Moreover, Diane had also been in discussion with the cathedral organisers about other aspects of this collaboration, and, as well as Paula’s visit, there were plenty of children’s activities available at the Cathedral Lodge which took as their inspiration the Canterbury Bestiary. 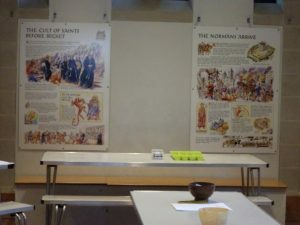 As you can see below this child-friendly workshop was held in a room that also houses panels from a much earlier Canterbury Christ Church exhibition on the history of Canterbury. 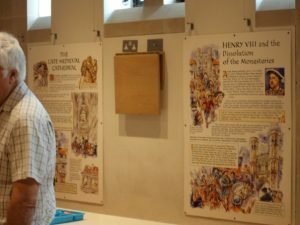 This Heritage Lottery Funded project (in two parts) was under the overall leadership of Mike Butler, CCCU’s Cultural Manager, who at the time was also running the Sidney Cooper Art Gallery. These panels relate to the first section of the project that focused on Canterbury’s history up to 1600 under the title Canterbury: England’s Crucible, which I led in collaboration with the artist David Hobbs. 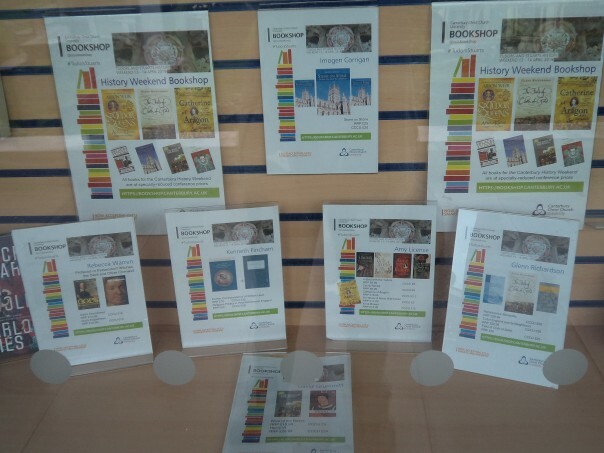 The second part was led by Dr Doreen Rosman, a retired history lecturer from the University of Kent and covered the city’s history from 1600 to the present day. David Hobbs was again the artist. For anyone interested a combination of both books was subsequently published and is still available at ‘all good book stores’ and the ISBN is 978-1-909067-02-8. Thursday brought a committee meeting of the Kent History Federation. As some of you may remember the Centre hosted the Federation’s annual conference earlier in the year on ‘Tudor and Stuart Canterbury’ and a report on the conference is a major feature in the Federation’s latest journal which has just been published. 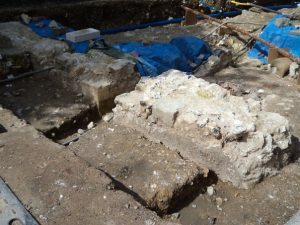 For those interested, please either see the journal or a blog report on the Centre’s website at: https://blogs.canterbury.ac.uk/kenthistory/tudor-and-stuart-canterbury-universities-working-together/ . Anyway, as a result of this I have found myself on the committee and if any affiliated Kent local history group would like to host the Federation’s conference in 2019, the chairman would be delighted to hear from them at chairman@kenthistoryfederation.org . It is an interesting event to organise, the Federation is very helpful, and it gives you an opportunity to showcase your area’s history. The Federation’s journal also has a series of articles and among these this time is one by Charlotte Young (Royal Holloway, London University). Charlotte spoke at the conference on the problems Lady Wotton endured as a result of the sequestration of much of St Augustine’s Abbey, which had become a minor royal palace after the Dissolution that was then rented out by the Crown. In her article she elaborates on some of the points she raised at the conference and it is fascinating to find out that when the parliamentary-appointed appraisers arrived at Lady Wotton’s palace in May 1643 among her possessions were two Irish harps, two perches for hawks and nine Irish tapestries. Two other speakers at the conference will also be lecturing on Canterbury and Kent in the next few months for the Canterbury Historical and Archaeological Society [CHAS]. Firstly, Dr Stuart Palmer will be speaking in on 9 January 2019 on ‘Dining together: banquets, breakfasts and corporate solidarity in early Tudor Canterbury’; while Professor Jackie Eales will consider ‘Kent and Turkish piracy in the 17th century’ on 13 March 2019. Additionally from the Centre and for CHAS, Professor Louise Wilkinson will discuss ‘Women and chivalry’ on 14 November 2018, and in the following month Professor Kenneth Fincham (also speaking at the Centre’s Tudors and Stuarts History Weekend April 2019 on the making of the King James Bible) will assess ‘Anglicanism and revolution in 17th century England’. And just to highlight the versatility of the Centre’s staff, I’ll be speaking at the joint Centre and Friends of Canterbury Archaeological Trust [FCAT] September lecture on ‘Pigs in medieval Kent’. Friday was busy too, and I very briefly joined Louise and Dr Emily Guerry (University of Kent) at the cathedral’s stained glass studio where Leonie Seliger and Dr Rachel Koopmans gave us a preview of their important work on one of the earliest windows in the Becket miracles stained glass windows sequence. This pilot project, funded by the Friends of Canterbury Cathedral, has allowed them to look in detail at the main panels in this window. Without, I hope, giving anything away because their findings will be released to the press very shortly they have made some startling discoveries that will even more put the cathedral’s stained glass on the map for late 12th century glass. 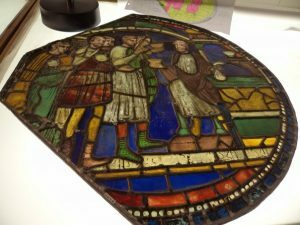 Moreover, their discoveries will pose lots more questions about the nature of stained glass workshops at the premier churches in western Christendom during this period, and especially the links between England and France. While other questions will focus on the (hierarchical) relationship between writing and images in the creation of these windows and how each may have been expected to ‘work’ separately and together for different audiences, and how the emphasis seems to have changed over time within the sequence of windows. All of this is very exciting and hopefully is merely the start of a much bigger project that will allow Leonie and Rachel to examine in detail all the Becket windows. Finally, it is now just over a month to the Michael Nightingale Memorial Lecture on Tuesday 25 September at 7pm (wine reception from 6.30pm) in Old Sessions House, which is a joint venture between the Centre and the Agricultural Museum, Brook. The speaker this year will be Professor Peter Vujakovic, a well-known member of CCCU’s Geography department, and his title is ‘The map as biography: maps, memory and the Kent landscape’. Do come along to this free event (voluntary retiring collection) because this is a fascinating and very exciting topic – no booking required, I hope to see you there.